On Saturday night Showtime will broadcast three bouts live from the Staples Center in Los Angeles, California. This fight card will be presented by Al Haymon’s Premier Boxing Champions. 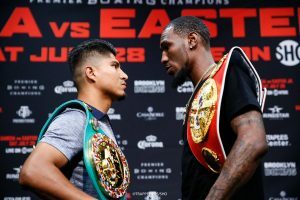 The main event of the night will be between Mikey Garcia and Robert Easter Jr. in a WBC/IBF Lightweight Title Unification Bout. The co-main event of the night will feature the return of heavyweight contender Luis Ortiz as he takes on Razvan Cojanu. Other boxers on the undercard include Mario Barrios, Jose Roman, Roberto Marroquin, and other prized prospects. The Barrios vs. Roman fight looks likely to be broadcast on Showtime in addition to the Easter-Garcia and Ortiz-Cojanu bout. Luis “King Kong” Ortiz fought a hard battle against Deontay Wilder in his last match but eventually succumbed to Wilder’s power. He returns on Saturday against Razvan Coajnu, a three loss Romanian heavyweight that should be viewed as a comeback opponent that stands little chance of winning. Cojanu will have a rather large five and a half inch height advantage, but will still be giving up about three inches in reach. Ortiz is eight years older than Cojanu. Ortiz has a strong edge in amateur experience. Cojanu has no notable amateur accomplishments while Ortiz was a multi time National Champion in boxing mad Cuba as an amateur. Ortiz’s age and recent inactivity could be a factor. He only fought once in 2018 and once in 2017 and is pushing 40. Cojanu fought once in 2017 and three times in 2016, but it should be noted that two of his past three wins were against opponents with losing records. Ortiz has beaten the likes of Malik Scott, Tony Thompson, Bryant Jennings, and Monte Barrett. His lone loss was to Deontay Wilder. Cojanu doesn’t have any big wins on his resume, but his best wins have come against Zhiyu Wu, Ed Fountain, and Manuel Alberto Pucheta. His losses were to Alvaro Morales, Joseph Parker, and Donovan Dennis. This fight will likely not be competitive. Ortiz should stop Cojanu within the first six rounds. Mikey Garcia is considered by many to be one of boxing’s best pound for pound fighters. He’s held world titles in four different weight classes spanning from featherweight to the junior welterweight divisions. Garcia is facing a fellow undefeated fighter in Robert Easter Jr. Garcia is only thirty so he’s still in his athletic prime, but Easter is three years his younger and will have a large four inch height advantage and an even larger seven inch reach advantage. Garcia does have an edge in power. He has thirty stoppage victories on his resume while Garcia only has fourteen. Garcia has stopped two of his past five opponents while Easter has stopped one of his past five opponents. Easter had a close win against Javier Fortuna in his last bout. He has also defeated the likes of Denis Shafikov, Luis Cruz, Richard Commey, and Argenis Mendez. Garcia has enver tasted defeat and has beaten the likes of Sergey Lipinets, Adrien Broner, Dejan Zlaticanin, Juan Carlos Brugos, Roman Martinez, Juan Manuel Lopez, and Orlando Salido. Garcia did have an extended break from boxing from January of 2014 to July of 2016 while he was working out promotional issues, but has been fairly active since then. Both boxers enjoyed moderate success as amateurs in the national scene. Garcia was a Bronze Medalist in the National Golden Gloves while Easter was a US Olympic Team Alternate. Technically, Garcia is one of the best in the sport. The height and reach of Easter should give Garcia problems early on, but Easter doesn’t have enough power for Garcia to worried about trying to force his way on the inside. The opening few rounds should be close, but Garcia should be settled and win a comfortable decision victory when the final bell rings.